by Walter Musciano from Scientific Models Inc. The Lucky Racer is 516.1 KB. Larger files take longer to load. This is the Lucky Racer listing page, here you can download the plan, article and see the main thumbnail and extra images. 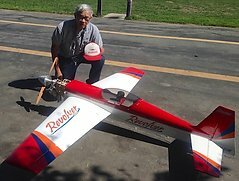 Lucky Racer is a low-wing sport control-line aircraft designed for a 1/2A (.049) glow engine, part of a long series of similar aircraft by Walt Musciano for Scientific Models. Common to the other aircraft in the series, Lucky Racer has a balsa "log" fuselage and all-sheet flying surfaces, simple and rugged. 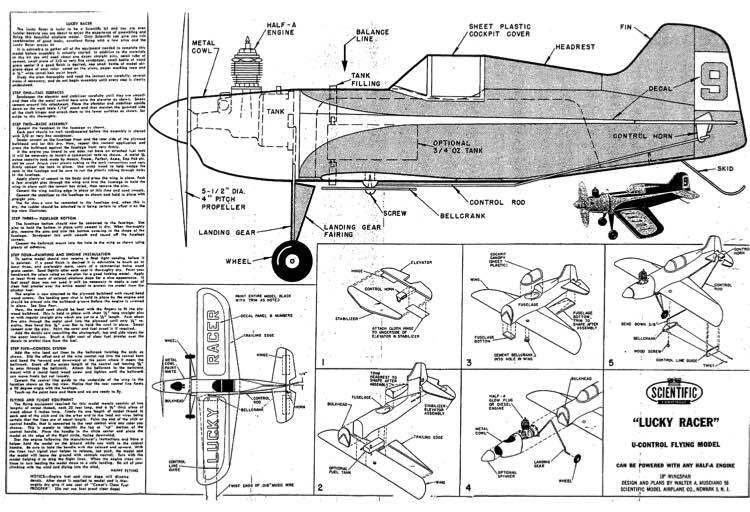 As the drawing shown was intended to illustrate assembly, dimensions of key items aren't shown. A profile fuselage would be a more practical fuselage, also lighter, than the original balsa "log" that requires significant shaping and is also noticeably heavy. These are the details for the "Lucky Racer" plan. If you would like to become a plan editor and help us to edit the attributes of all the plans in the website please click the "Edit Attributes" button below. Order your Lucky Racer prints today! The Lucky Racer plan can be printed on plain paper, tracing paper or polyester film and shipped worldwide. This tool allows you to calculate the cost of printing and shipping the Lucky Racer plans and its building article if available. If you need to resize a plan please contact us with the ID:82489 and the desired wingspan. I will calculate a price upon request, please contact me here mentioning this PlanID: 82489 and the job you wish me to do. This plan is 516.1 KB and was shared by our member aeroastro on 31/03/2015 22:27 in the PDF Bitmap Wood Model Airplane Plans (1) category.